Last weekend (3/16-17) we had freezing rain and snow - precluding even walking because of the winds. This weekend was much warmer and New Yorkers ran a marathon in Central Park and filled the playgrounds on Sunday morning. 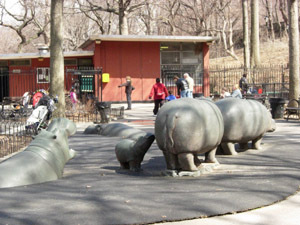 We met our son, daughter-in-law, and grandson in Hippo Playground in Riverside Park. He loves the slides - and I was warm enough to sketch the hippo sculptures. There are buds on the trees and the early spring flowers have stems about 4" above the ground. This is as close as we have gotten to "fresh" - wonderful fresh air to cure winter cabin fever. 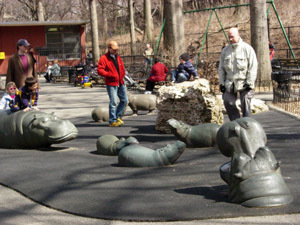 There are two groups of hippo sculptures - that children climb on and adults sit on. Here are two pictures that I took of the "animals." 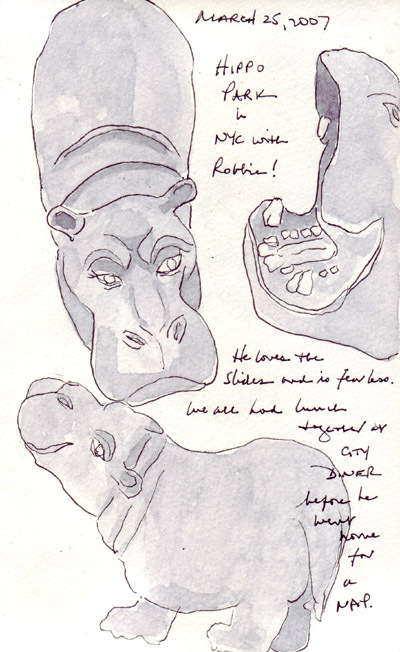 Very few New Yorkers even pay attention when I'm sketching, and while I was sketching the hippo head with open mouth, a woman kept talking to her friend and actually put her foot right up into the mouth obscuring my view. And I was standing not more than 4 feet from her! Great sketch and funny story. You are proof that there is nothing to worry about when sketching in public. Love those hippos and the fresh air. Great sketches! Love those hippos! Yes, it seems as if New Yorker behave sometimes in other ways than "normal" people would ;-)), nevertheless your hippos turned out great! You've done such a great job on that baby hippo, Shirley, I thought at first you had sketched him from life. I don't know what to make of the woman who put herself in the way of your drawing - she couldn't have been a sketcher, she'd be more perceptive. WHAT A TERRIFIC JOB!!! I have to admit, Shirley -- I LIKE YOUR hippos better than the real ones!!! You've given them charm!!!! Shirley, your work is just getting better and better? I really enjoy every visit to your blog. These hippos were a wonderful idea, they make a great subject. That looks like a really fun place to hang out. Great drawings. Great drawing of the hippos and your figure skeches. You should've drawn the foot in the mouth...that would've been a radical sketch! Oh ho! Shirley - I missed seeing these the first time 'round and found them today when looking at your yoga poses.. The Hippos are wonderful! lots of humour in these drawings, I think! Lovely sketches! I like those hippos and the way they emerger from the 'water'! I suppose I should be heartened by that woman, and her not noticing you, (scared as I am to draw in public) but that must have been a bit annoying! The variation in the application of the watercolour works really well in these delightful hippo sketches.